This series of four classes is designed to give beginners and those with a little experience a strong foundation in painting with dry(soft) pastels. We’ll start with a thorough introduction to materials and tools and move on to under-paintings and techniques for painting trees, skies and water. Students will learn how to plan ahead to avoid mistakes, the importance of value, color selection and treatment of edges, and more. To see the entire syllabus go to https://janthomasart.com/workshops. Location: The Lomitas Center, 2421 Lomitas Ave., Santa Rosa, CA. To register and reserve space, mail a deposit of $100 to be received by March 9, 2019 to Jan Thomas, 8729 Holly Leaf Drive, Windsor, CA 95492. You will receive a confirmation and supply list when deposit is received. 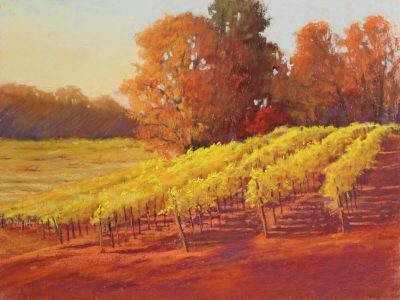 Jan is a Signature Member of the Pastel Society of the West Coast and has earned numerous regional and national awards for her impressionistic pastel landscape paintings. She has been teaching weekly pastel classes for the past five years.